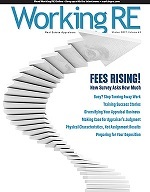 Editor’s Note: Here’s an inside look at how appraisers measure buildings. As appraisers and review appraisers, some of us have seen fellow appraisers relying on building area size data from leases, the local assessor’s offices, property managers, developers, blueprints, etc. The whole key and foundation for an accurate appraisal is calculating the measurements and quantities correctly. Outlined below are a few examples of when problems may occur. Many appraisers rely on the building areas reported by the local assessor’s offices to confirm and verify comp data, but too often appraisers rely on the assessor’s reported building areas exclusively to report the Subject’s size. As long as an appraiser is physically at the Subject property, how long does it take to measure the Subject’s improvement? Why take on the liability of relying exclusively on somebody else’s measurements and quantities? Most of the assessor’s websites have disclaimers indicating that they are not responsible for inaccuracies. Who knows the experience and skill level of the representative(s) from the local assessor’s office, at measuring the Subject or even the comparable properties? What if the property representative provides the appraiser with blueprints, plans, specifications and/or a survey? What if the property manager, developer or listing agent provides their building area quantities? Should the appraiser still measure the Subject? Let’s review a few scenarios. What happens if the plans illustrate the Subject as a 50,000 square feet building? What if these plans do not include a 25,000 square feet addition that was added to the building after the date the plans were produced? What happens if there was a fire five years ago and a portion of the subject was razed and never rebuilt? What if the appraiser is appraising a recently built property and the plans provided are not the final revised and approved “as-built” drawings, recorded in the local building department? Maybe there was a size reduction in the building for budgetary purposes. In all of these cases the appraiser could easily conclude an incorrect building size without measuring or at least spot-checking the size of the Subject, which could result in great liability. An appraiser is appraising a building and the tenant is paying rent for 10 years. The appraiser’s scope of work directs him to estimate the market value and market rent of the Subject for lease negotiation purposes. The appraiser reviews the lease, which indicates the size of the subject is 77,000 square feet. The building engineer provides the appraiser with a set of original blueprints, which the appraiser copied and reduced. The appraiser’s final calculations are approximately 62,000 square feet for the subject. Another appraisal that was completed a few weeks prior simply used the 77,000 square feet quantity as reported in the lease document. Obviously, this report is artificially inflated. The more careful appraiser figured everyone would be screaming when they opened up his report, so he took the reduced blueprints and inserted then into the report, with verified and confirmed field measured dimensions. This showed all of the individual areas that were used to calculate the building area quantities. After submitting the report there were no questions asked by anyone because the calculations and dimensions were provided to support the (careful) appraiser’s conclusions. I spoke to a few construction estimators and construction managers who have estimated thousands of projects from the following plan types: civil, architectural, structural, mechanical and electrical. The calculations from these documents were not always accurate. Simple items like measuring water and sewer lines were not correct. Architect’s building areas were also sometimes incorrect. Appraisers should be cautious when measuring a commercial condominium. A corner unit condominium with outside dimension measurements of 25 feet by 40 feet would equal a gross unit area of 1,000 square feet. The same corner unit with inside dimension measurements of 23 feet by 38 feet would equal a net unit area of 874 square feet, which accounts for a 126-square-feet difference in area. If the Subject’s unit value is $125 per square foot, this could account for a $15,750 or 14.42% difference in value (based on a typical value in this area). Appraisers should consider providing both the net and gross unit areas of condos in their reports for clarification purposes. Also, consider verifying and confirming the unit’s area measurements and the measurement methodology used for the comparables used in a report. If the Subject is based on net interior measurements and the area of the comparables are based on gross exterior measurements, then this inconsistency in methodology can result in the incorrect application of the sales prices per square foot of the comparables, as they relate to the Subject. An appraiser is hired to appraise an office condominium unit in a multi-tenant office condominium building. The lease is based on the developer and listing agent’s gross leasable and net leasable areas. The appraiser measures the unit and the common areas and finds the following: the actual net leasable area of the unit and the common core area are actually less than that of the developer and listing agent, and the pro-rata share of the common area of the Subject’s unit is incorrect. The cash buyers of the unit are not in the field of real estate but are grateful that the appraiser brought this to their attention, since a lender’s appraisal was not required. If these errors in the building quantities were not brought to the buyer’s attention, the buyers would have paid more than they should have, not only for the initial office condominium purchase but for the monthly assessments, which are based on a pro-rate percentage of the Subject’s unit, as it relates to the total area of the units within the condominium office complex building. Field measuring and/or verifying dimensions from surveys, plans, blueprints, leases or other documents, indicating building area sizes and dimensions, are extremely important to reduce the liability of appraisers. Buildings are razed, new additions are built and the skill and experience level of those providing quantities are always in question. Measure or at lease spot check dimensions from plans. It is all about providing a quality product for our clients, intended users and reducing our liability. Provide the client the information and inform them of any inconsistencies, then it is up to the client to decide exactly what to do from there. Mark Langhamer is a Certified General Real Estate Appraiser, Licensed Managing Real Estate Broker and Construction Estimating & Management Consultant. He can be reached at: mark@ameri-mark.net.